Shawn Flarida and Smart Spook led the United States team to a first place finish. Photo by Leslie Potter. With a great sense of anticipation, Team USA’s Aaron Ralston made history as he entered the ring as the first athlete ever to compete in the Kentucky Horse Park’s new indoor arena in Kentucky Cup Reining, the first test event for the 2010 Alltech FEI World Equestrian Games. “I really didn’t realize it was happening until afterwards, and then it opened my eyes and it really started to sink in. To be involved in something so big and special as these test events for the 2010 Alltech FEI World Equestrian Games and to be on the team with these athletes is so special. It’s all bigger than just me. It’s a great honor and it’s very humbling,” said Ralston, 32, of Silt, CO, winner of team Gold and individual Bronze Medals at the 2006 World Equestrian Games. Kentucky Cup Reining, a CRI4* competition officially sanctioned by the International Equestrian Federation (FEI), featured teams from Canada, Mexico, and the United States. The U.S. finished first with a team score of 659.50, followed by Canada with 641.00 and Mexico with 631.50. The Individual Final will be held on Thursday, July 23 at 7:30 p.m.
For the test event, Team USA fielded a seasoned team featuring four WEG Gold Medalists. 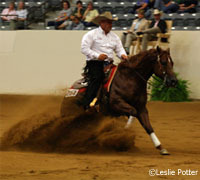 They were led to the win by Shawn Flarida, 40, of Springfield, OH, double Gold Medalist in reining’s WEG debut in 2002. Flarida received a score of 370.00 from the five-judge panel for his ride on Smart Spook, an 8-year-old, sorrel AQHA stallion owned by Rosanne Sternberg of Aubrey, TX. Also turning in stellar performances for the winning U.S. team were Ralston, who scored 354.00 on Double My Whiskey, a 6-year-old, Quarter Horse stallion owned by Waggoner Estate of Vernon, TX; his 2006 WEG Gold Medal teammate Dell Hendricks of Tioga, TX, who scored 367.00 on Starbucks Sidekick, a 9-year-old, Quarter Horse, stallion owned by Adair Reiners, LLC; and Tom McCutcheon of Aubrey, TX, winner of team Gold and individual Silver Medals at the 2002 WEG, who scored 362.50 on Darlins Not Painted, a 7-year-old, American Paint Horse mare owned by Randy Paul of Scottsdale, AZ. As the 2010 Alltech FEI World Equestrian Games come to Kentucky, the sport of Reining is sure to enjoy a sort of “homecoming” in the US, as the only western discipline recognized by the FEI. 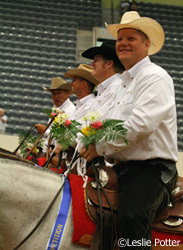 Plans are well under way to feature Reining in new and exciting ways in 2010, including a newly approved schedule format – allowing for more public sessions of the discipline.